Benefits Open Enrollment is held annually in July. 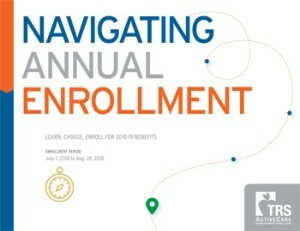 Enrollment can be done online or in person. Download the 2018-19 plan highlights & rates. All changes are effective starting September 1, 2018 through August 31, 2019. For additional information and the latest updates on insurance, see the Insurance Plan section below or visit the TRS Active Care website. For additional services provided by MISD, see the Life Insurance & Additional Services section below. NOTE: By logging into the Employee Portal, you can update your contact information, view/change your beneficiaries, sign-up for the staff clinic and accept/decline insurance. Mansfield ISD contributes $250 to each ActiveCare premium. What's New & What's Changed in the 2018-19 Plan? Split Premium Application - For married employees wishing to combine the cost of family coverage while being employed with districts/entities participating in TRS-ActiveCare, please contact the Benefits Office. Loss or curtailment in health coverage of employee or spouse due to change in spouse’s employment and upon meeting a required eligibility period in spouse’s open enrollment. TRS Enrollment/Drop Form (for Special Enrollment Event) - This form must be turned in within 31 days of a Qualifying Event with the proof of loss or new coverage showing effective date. Basic Life Insurance - Basic life is insurance coverage provided to you by your employer. It provides a cash death benefit to your beneficiary upon your death to help meet a variety of financial needs. Permanent life is an individual life policy that provides a specified death benefit to your beneficiary at the time of death. The advantage of having a permanent life insurance plan as opposed to a group supplemental term life plan is that the permanent life insurance is guaranteed renewable, portable and typically premiums remain the same over the life of the policy. Accidental Death & Dismemberment is life insurance coverage that pays a death benefit to the beneficiary, should death occur due to a covered accident. Dismemberment benefits are paid to you, according to the benefit level you select, if accidentally dismembered. For additional information about any of the plans above, please contact the Benefits Department or visit the Employee Benefits Portal. Don't see the form you need? Try the Intranet Documents & Forms page.